Can’t meet your revenue numbers—or payroll? Don’t know how your company compares to its peers? Your competitors have more market share? Multiple HR issues—wrong fit, can’t pay competitive rates, team not motivated? Does tax time feel like death warmed over? Do you even know your company weaknesses? Are you working too many hours at the office? Is your family taking a back seat to your business? J. Richard Claywell, CPA, considered by many to be the best business consultant in Houston and beyond, has been around since 1984, and has helped numerous companies successfully increase value and profits. The J. Richard Claywell, CPA team uses the CoreValue® system–the same approach that has been used to help over 5,300 companies (generated over $6 billion in increased value) and is an approach born at MIT, accepted by NACVA, and is PROVEN to produce excellent results and get you to the next level—quickly and affordably. WHY Choose J. Richard Claywell, CPA for your business consultant? Return On Investment (ROI) based – What Can You Expect? First, J. Richard Claywell, CPA uses one of the industry’s BEST and PROVEN methodologies—from CoreValue® (developed at MIT) to uncover the core problems or inefficiencies your business is facing–and show you what they are worth if you fix them. Holistic Assessment. Evaluates the 18 critical drivers (operations, sales & marketing, brand, senior management, recurring revenue, etc.) that reveal the strength or holes within your current business. Peer Comparisons. Uses industry actual sold businesses within your industry to determine your company’s value now, as well as what it “could” be worth if you addressed the problems and inefficiencies. Emphasis on Best Practices. We measure your company to determine your alignment with a vetted set of private businesses. J. Richard Claywell, CPA will help you identify the RIGHT areas to work on first so you will realize the most value within your company. Quick & Affordable. The free up-front initial assessment only takes about 15 minutes and you get a valuable, detailed report with actionable steps, just for participating. The 2nd tier assessment is usually conducted as part of the formal engagement, but it still only takes 60-90 minutes and is incredibly thorough. Deep Dive Analysis. The analysis typically includes a value gap analysis, shows the increase in value over time for completed tasks, includes a ‘What If?’ scenario to test changes, benchmarking, CoreValue rating, plus an analytics report, Key Performance Indicators (KPI) and more. You get a customized plan of action that includes detailed tasks—ready to execute. Plus, you get the help from a Houston business consulting team with a combined profit and value enhancement experience of over 30 years. So, you get it done right and grow your company to the next level. Most Detailed Reports. 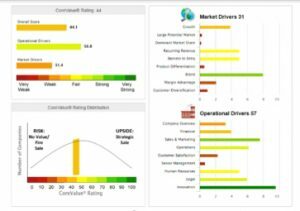 In addition to calculating your potential business value and rating your operations, your report benchmarks you against your best performing peers. You will clearly see the risks to your company, understand why they need your attention, and what your company could be worth after implementation. Value Gap. Determines what your business would sell for today, and what it COULD be worth–based on market data showing what the best run businesses actually sell for. Then includes the detailed steps to improve your business to get the highest value—so you can increase profits now and later. Workbook. Includes a workbook of specific tasks to increase company strength and value; and tracks the increased value you create over time. The dynamic, actionable plan guides you through implementing best practices, strengthening operations and building value. Once we’ve identified what to work on, we can help you with value growth services, strategic financial planning, etc. In addition, what we don’t do personally, we can help connect you with our network of other specialists and some of the best consultants we have pre-vetted and/or worked with. 5. Return On Investment (ROI)-based – What Can You Expect? The assessment shows the deficiencies in your operations and why you should work with us. You will see how our services pay for themselves through an increase in operational efficiency. We generate a complete list of actionable recommendations and each item calculates an associated ROI. Based on our suggestion you pick the area with the greatest potential ROI and get started. On average, you should get a 10x return for your dollars spent. There’s no need to pay for the high executive overhead you find in the large business consultant firms. Easy and FREE to get started. Free assessment. Free report. There is NO cost. You get a valuable, actionable Discovery Report–in minutes. It shows what you are worth, what you can be worth, and how to get there–for free. If we see a good fit and we can prove value, then our job is to guide you through the steps and help you get your return quicker. Motivating and Exciting. The initial assessment provides hope and excitement about your direction and reinvigorates your business. The focus is on operations, not just financials, with substantial client interaction. The actionable plan helps you invest in the process, seeing immediate progress, tangible milestones and the ROI for the work we do. J. Richard Claywell, CPA has earned the CVGA designation, which deals specifically with profit and value enhancement, by satisfying the stringent criteria of professional standards in business operations and financial advisory services. Call us at (281) 488-7531, (866) 499-7531 or click here to schedule a free initial assessment of your company strength and value. We also serve Houston / Galveston, Dallas, San Antonio, Fort Worth, Austin, Corpus Christi, El Paso, and other Texas cities and beyond. ©2019 J. Richard Claywell | Website design by Visible Logic, Inc.